Then there is the other position — to seek for an explanation, to seek for the real, to discover in the midst of this eternally changing and evanescent world whatever is real. In this body which is an aggregate of molecules of matter, is there anything which is real? This has been the search throughout the history of the, human mind. In the very oldest times, we often find glimpses of light coming into men’s minds. We find man, even then, going a step beyond this body, finding something which is not this external body, although very much like it, much more complete, much more perfect, and which remains even when this body is dissolved. We read in the hymns of the Rig-Veda, addressed to the God of Fire who is burning a dead body, “Carry him, O Fire, in your arms gently, give him a perfect body, a bright body, carry him where the fathers live, where there is no more sorrow, where there is no more death.” The same idea you will find present in every religion. And we get another idea with it. It is a significant fact that all religions, without one exception, hold that man is a degeneration of what he was, whether they clothe this in mythological words, or in the clear language of philosophy, or in the beautiful expressions of poetry. This is the one fact that comes out of every scripture and of every mythology that the man that is, is a degeneration of what he was. This is the kernel of truth within the story of Adam’s fall in the Jewish scripture. This is again and again repeated in the scriptures of the Hindus; the dream of a period which they call the Age of Truth, when no man died unless he wished to die, when he could keep his body as long as he liked, and his mind was pure and strong. There was no evil and no misery; and the present age is a corruption of that state of perfection. Side by side with this, we find the story of the deluge everywhere. That story itself is a proof that this present age is held to be a corruption of a former age by every religion. It went on becoming more and more corrupt until the deluge swept away a large portion of mankind, and again the ascending series began. It is going up slowly again to reach once more that early state of purity. You are all aware of the story of the deluge in the Old Testament. The same story was current among the ancient Babylonians, the Egyptians, the Chinese, and the Hindus. Manu, a great ancient sage, was praying on the bank of the Gangâ river, when a little minnow came to him for protection, and he put it into a pot of water he had before him. “What do you want?” asked Manu. The little minnow declared he was pursued by a bigger fish and wanted protection. Manu carried the little fish to his home, and in the morning he had become as big as the pot and said, “I cannot live in this pot any longer”. Manu put him in a tank, and the next day he was as big as the tank and declared he could not live there any more. So Manu had to take him to a river, and in the morning the fish filled the river. Then Manu put him in the ocean, and he declared, “Manu, I am the Creator of the universe. I have taken this form to come and warn you that I will deluge the world. You build an ark and in it put a pair of every kind of animal, and let your family enter the ark, and there will project out of the water my horn. 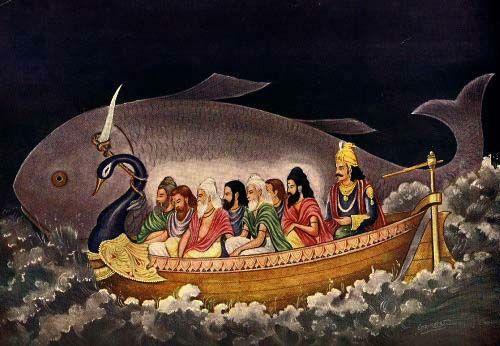 Fasten the ark to it; and when the deluge subsides, come out and people the earth.” So the world was deluged, and Manu saved his own family and two of every kind of animal and seeds of every plant. When the deluge subsided, he came and peopled the world; and we are all called “man”, because we are the progeny of Manu. Thereafter, the powerful Manu created the following: the Creator (Brahma), the desire-less state and desire, the power of inner Wisdom, Buddhi (intelligence), Chitta (heart), the power of vision and the Breath at the heart.